Companies like Airbnb and Uber show us just how powerful the collaborative economy is, and we believe that this phenomenon is only going to grow stronger. You’ve been at the center of our project since the very beginning, and now we’d like to get you even more involved and to share our success with you. Sponsorship programs are already widespread on the Internet, but still remain very much virtual. This is why we have included member’s cards with each watch. 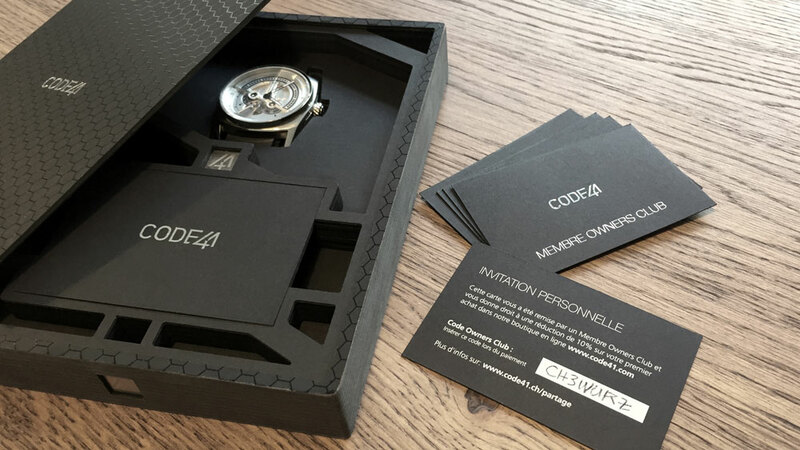 That way, it will be easy for you to spread the word to anyone who might take a liking to your beautiful CODE41 watch ;-). Thanks to you, your new friend will enjoy a 10% discount on their first purchase. As for you, you will get your commission. One of the main problems with online sales is not being able to touch or try the watch before buying it. This is why we are going to develop an application that will allow a potential buyer to meet the owner of a watch and try it. Like this, the buyer will be able to order their watch in full confidence, and the sponsor will get their commission. Of course, for such a system to work, we need a certain number of watches to have already been delivered. This is why we are thinking of activating this function in the first quarter of 2018. What do you think? Is it a good idea? Cast your vote below and leave a comment at the bottom of the page..
Another way of overcoming the virtual barrier could be to rely on our large community to organize CODE41s meet-ups of between 1 and 10 people. The collection would be displayed in its entirety and those invited could try and order their watch directly. It would then be delivered to them within 2 days. The ambassador would have to pay a deposit for the display batch, but would receive a nice commission on any sales they generate. That would be a chance to go down a little more in history. If you are interested in taking part in such a project, contact us here ASAP. The implementation of such a system takes a bit of time, but we’d like to know your opinion now. So, what do you think? J’attend ma montre avec “patience ” et je sais quels sont les amis à qui je vais la montrer.